Dr Sarvapali Ramchurn's research centres on developing intelligent software and robotic agents. Artificial intelligence expert Dr Sarvapali (Gopal) Ramchurn from the University of Southampton has been awarded a grant from the AXA Research Fund, becoming only the second UK-based academic to ever be supported by the initiative in the field of Responsible Artificial Intelligence. The AXA Research Fund, the philanthropic initiative of the AXA Group, is dedicated to boosting scientific discoveries that contribute to societal progress will provide him with €250,000 to further investigate how AI can be responsible and accountable. The award recognises Dr Ramchurn's innovative contributions to his field, which includes over a decade’s work at the University of Southampton’s renowned Department of Electronics and Computer Science (ECS). Dr Ramchurn's research has largely centred on the development of intelligent software and robotic agents, with a focus on how such agents are designed to work alongside humans and other agents. His next steps will focus on the design of interactions with AI that ensures that humans have reasonable expectations about the behaviour of intelligent agents and supports rather than hinders their daily activities. Researchers from the University of Southampton have previously worked on the design of responsible AI in a number of projects funded by the Engineering and Physical Sciences Research Council (EPSRC). These include ORCHID, a programme grant that investigated the notion of Human-Agent Collectives, and the A-IOT project which looks at developing the Autonomous Internet of Things. The AXA Research Fund was created in 2007 by the AXA Group to boost scientific knowledge and discoveries that contribute to the progress of human societies. The Fund has already supported 563 projects led by researchers of 58 nationalities, in 35 countries. The AXA Research Fund also helps scientists share their knowledge with a wider audience, in order to inform decision-making and actively engage people in transformative actions to better life today and tomorrow. Find out more about the University’s AIC research, themes and people on the ECS group’s website. 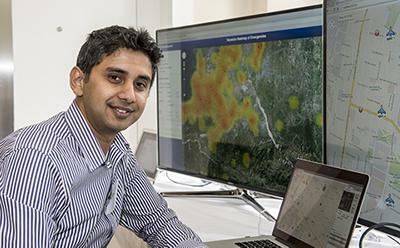 A grant from the AXA Research Fund will help Dr Sarvapali Ramchurn expand his research into responsible AI.